If you are reading this report on Monday morning your editor will be joining 3,000 travel trade people, and the media, for the spectacular inaugural of Norwegian Cruise Line’s latest floating resort, Norwegian Breakaway at Southampton. 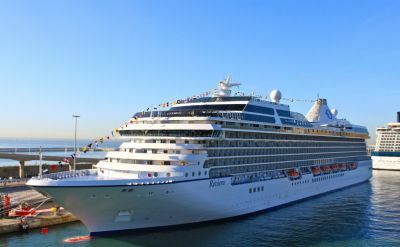 With the ship built in Germany, and based in New York, it did seem a great idea to overnight at Britain’s major cruise port, a wonderful opportunity to introduce an inspirational product that will clearly set new standards for holidays at sea. Next month we will bring you a more detailed review. There are 28 eating outlets to cover, all sorts of entertainment venues, the first Aqua Park at sea, and a variety of accommodation ranging from the most sumptuous of suites to 9sq m internal studios on deck 10 and 11 featuring a one-way window to the corridor. 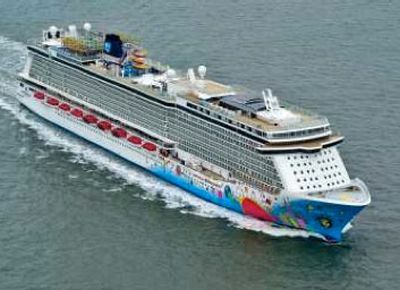 Norwegian Breakaway’s entertainment will include three Broadway shows: five-time Tony nominated ‘Rock of Ages’; the dance sensation ‘Burn the Floor’; and Cirque Dreams & Dinner Jungle Fantasy’. The famed comedy troupe The Second City, Howl at the Moon duelling pianos, and New York’s own Slam Allen will perform on the vessel. Norwegian Breakaway will also feature an exciting fireworks show on every cruise that will dazzle guests on the second to last night at sea each week, and will be the grand finale of a decadent 1980s-themed deck party. Breakaway’s programme includes a series of seven-day cruises out of Manhattan to Bermuda through the summer followed by a winter season, again seven days, down the US East Coast to Nassau Bahamas, Great Stirrup Cay (NCL’s own island), and Port Canaveral. For an inside twin Including flights from Heathrow, and overnight stay in New York and transfers availability starts from £1,583. www.breakaway.ncl.co.uk. Arriving on Oceania Riviera was a delight, having been told that Miami is the largest cruise port in the world it seemed a slow and uncertain boarding process was likely, but No, the coach from our overnight hotel dropped us outside the doors of the modern terminal, and escalators whisked us up to the check-in desks with no queues and very easy access on to the ship. Our cruise round the ‘Caribbean Hideaways’ continued in the same fashion. Launched in May 2012 the Riviera is the newest ship on the emerging Oceania fleet and from first impressions in the light and well furnished reception area, with its grand staircase, beautiful crystal lighting and glass fronted lifts, to all the public rooms and the spacious suites with marble bathrooms including full size bath and separate shower, everything sparkled and gave the impression of modern grandeur. A special mention must be given to the library, furnished with leather covered chairs and huge footstalls, authentic looking replica fireplaces, the area is broken up into cosy spaces by the library cupboards holding over 8,000 books, most of them as yet unopened! Oceania prides itself on the food offered in the restaurants, and rightly so. From the Grand Dining Room with its magnificent chandelier and beautiful table settings like a modern palm court, with its formally attired waiting staff who managed to be both professional and friendly at the same time. The Terrace Café my favourite for lunch, though open for breakfast and dinner as well, offered a wide range of food to please every palate from lobster to steak cooked on hot plates before your eyes and pasta dishes, and in the evenings has international specialities. There are other restaurants to choose from, these have to be pre-booked, but are at no extra charge. Red Ginger is an Asian cuisine restaurant which has an authentic Far East atmosphere; the Polo Grill, a classic steakhouse, Toscana a busy noisy ristorante straight from Italy, and Jacques, a delightful French restaurant with excellent food and wines to match. There is plenty to do on Riviera, whether you wish to be active either in the well appointed gym, or exercise in a class, swim in the pool, or play deck games; if you want peace have a relaxing treatment in the superb spa; maybe take your chance in the casino, there is nightly entertainment from a pianist in the bar, and from an excellent band, and shows in the comfortable theatre. 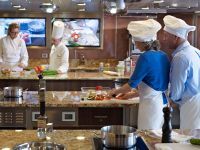 Riviera now has a Bon Appétit culinary centre offering hands-on instruction to those wishing to add professional touches to their catering efforts, it is necessary to book these well in advance as they are very popular. This was my first cruise with Oceania, and from boarding it was a great experience. The ship has a capacity of 1,250 passengers and was full, but the international crew of 850 were on hand at all times to offer excellent service, making us feel like pampered guests. All this attention and free air fares on every voyage made the whole trip excellent value for money.